Paleontologists have uncovered several skulls of what appear to be domesticated dogs in a ritualized burial in the Czech Republic. The study, titled Palaeolithic dog skulls at the Gravettian Předmostí site, the Czech Republic (subscription required) was just published in the Journal of Archaeological Science by Mietje Germanpré, Martina Lázničková-Galetová, and Mikhail Sablin. The actual timing of the domestication of wolves has been contended, and this particular find may push that date back by several thousand years to the Aurignacian period of Upper Paleolithic Europe (45,000 to 35,000 years ago– the same culture that made the paintings at Chauvet Cave*). The skulls of wolves and dogs have different size and shape distributions; by analyzing traits like snout length, skull length, or braincase, it’s possible to classify each skull as more closely resembling wolves or dogs. 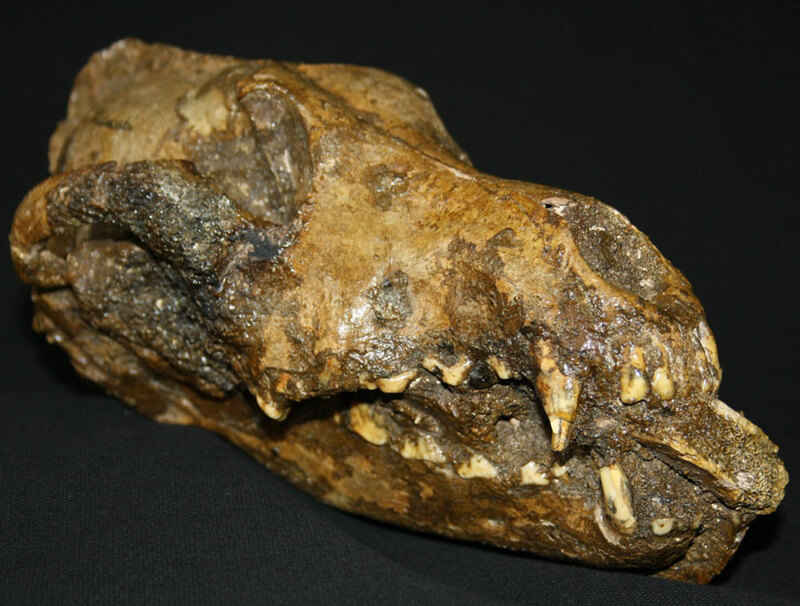 The bones analyzed by Germanpré and colleagues were found to have a distribution of morphologies– one resembled Pleistocene wolves, three resembled dogs, and several appeared to be hybrid in nature. What I personally found interesting were the cultural implications of this study. First, the skulls had holes drilled in them, suggesting that the brains had been removed (and probably not to be eaten). Additionally, one of the skulls was buried with what was likely a mammoth bone in its mouth, apparently put there by humans. The authors speculate that the removal of the dogs’ brains and the addition of the bone had ritual significance, possibly indicating a deeper spiritual connection between humans and their paleolithic companions. This is an interesting interpretation, and is certainly not surprising with what we know about the role of dogs in many cultures (including our own!). Additionally, the prevalence of mammoth bones at the site, as well as the placement of what is likely a mammoth bone in the mouth of one of the animals, suggests that early dogs were sharing the humans’ mammoth meals. Germanpré and colleagues speculate that the dogs may have assisted the humans in carrying tusks and meat; they may even have been an important part of the hunt. One of the things I love about paleoecology and archaeology are the ways in which we construct a picture from incomplete data– unable to observe ice-age cultures and landscapes first-hand, we’re instead left to make inferences in the way that a forensic scientist reconstructs an event from fragments of evidence at a crime scene. Germanpré and colleagues have some interesting data, and they use it to tell a compelling story about the early relationship between dogs and humans. We may never know precisely how true the story is– skulls and mammoth bones can only take us so far– but it’s certainly not difficult to paint dogs into a picture of a paleolithic hunter carving meat from a mammoth. *Speaking of Chauvet Cave, if you haven’t seen Werner Herzog’s documentary Cave of Forgotten Dreams (ideally in the theater), I highly recommend it. Chauvet cave is closed to the public to help preserve the paintings, and so experiencing these stunning paintings on the big screen may be the closest most of us will ever come to seeing them first-hand. P.S. The Donors Choose Science Bloggers for Students Challenge is still going on! Please visit my giving page to check out a few science classrooms in desperate need of basic supplies, like goggles and aprons to practice safe science in the lab. 100% of proceeds go to the classroom projects, and every $5 gets you an entry in a drawing for custom science magnets, made by yours truly in the theme of your choice! I love the history behind animal domestication, especially dog domestication. It must be really hard to make that destinction between when bones represent domesticated dogs and when they are wolf bones, even tamed wolf bones. It must have taken a few generations of semi-selective breeding for wolves to shrink to domesticated size. Plus, the original domesticated dog must have looked really wolf like. They certainly were not cocker spaniels. Its hard to really know when domestication took place. DNA tells one story and fossil bones tell another. Dogs arrived in N. America with humans, so our relationship in Asia and Europe must go way back. What early human would not want a dog? They would have been an advantage. Great warning system against large predators and could probably be used to track and hunt. It would be a disadvantage not to have one. Its funny though, they are the only large predator domesticated by man. Anyway, great post and blog.